Also classed as a longer-spined variety of opuntia polyacantha, opuntia erinacea, the Mojave or grizzlybear prickly pear, is widespread in distribution and somewhat changeable in appearance; the main characteristic is the dense spines, which are white or pale yellow in color, reddish at the base, and between 1 and 7 inches in length (on the same plant); this variation gives the plant a shaggy, unkempt appearance. The shorter spines are quite thick, and some point downwards, while the longer ones (more noticeable on older pads) are thin, almost hair-like. 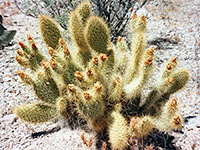 The cactus forms low, medium-sized clumps, generally no more than 2 feet high but up to 10 feet across. The species is quite frost tolerant and is found in locations up to 7,000 feet elevation, such as the South Rim of the Grand Canyon. The light yellow flowers are followed by reddish-green fruits.